Biotherm new Life Plankton Clear Essence comes in a lighter texture but packed with highly concentrated 5% Life Plankton which is the highest concentration yet possible – it regenerates skin. As a result, skin renewal is optimized and skin appears brighter and younger. I love Life Plankton Clear Essence light and watery texture with refreshing aquatic sensation absorbs rapidly, to streamline the skin routine. Even I apply a few layers on my skin it absorb very fast into my thirsty skin. I don’t feel any stickiness or oiliness on my skin. It gives an instant freshness, moisture and suppleness to my skin. Oh yes! Before you use it remember to shake it to awaken the power of Life Plankton. As you can see there is a later of white powdery that sink in the bottom of the bottle that’s the Life Plankton so remember to shake it first ya. Check out My 8 Days Skin Transformation Journey video. 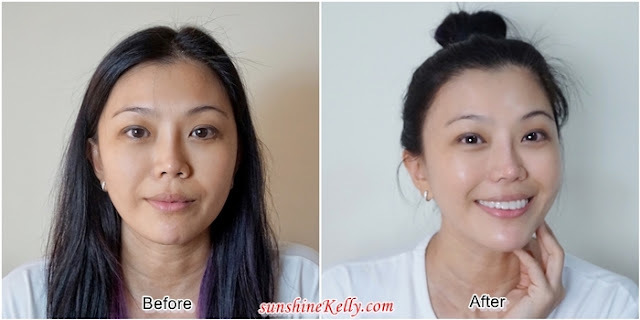 You can see how my skin changes throughout the 8 days and there are many ways I incorporate the Biotherm Life Plankton Clear Essence into my daily skincare routine. I even use it as my quick mask too. Plus Biotherm new Life Plankton Clear Essence also comes with clarifying light texture and system enriched with gentle micro-exfoliating agents that helps to it clears away dull, life-worn cells to reveal smoother, newborn like skin. After using it diligently for 8 days, I can see my skin transformed. Overall my skin is hydrated and glowing but not greasy. My pores are reduced and skin is refined; translucent, as if lit from within. When my skin is well hydrated, those dry and fine lines are less visible or not visible anymore. Skin texture becomes smoother and clearer plus dark spots are lighter. Sometimes when I travel, I will be out the whole day so when I reached my hotel in the evening my face it’s a bit inflamed or red due to the heat or pollution or the weather changes. I also use Biotherm Life Plankton Clear Essence as my quick mask to soothe my skin and it works, immediately I feel refreshed and after 20 minutes my skin is calm then I apply a few more layer of this essence to replenish back the moisture. I love the soothing and skin glowing effect after I apply this essence plus it ensures my skin moisture is balance. When skin is hydrated, moisture and luminous, it’s easier for me to apply makeup and it looks more natural plus last longer too. Overall I’m glad that to embark my 8 Days Skin Transformation Journey with Biotherm Life Plankton Clear Essence. There are a lot of improvements on my skin in terms of hydration, radiance, skin barrier and also firmness. Biothem is a trust brand in skincare. And the famous one is their Life Plankton Clear Essence. Have try their product before. i would love to try this. The beforevand after use show a remarkable changes. such a great product... u really hv flawless skin.. so envy.. pretty lah... as always!~ nice product! I love using their products too! nice Biotherm product! Your skin transformation is so good. oh ya I shud use all my essence as mask so i can finish them fast hahaha! !i always love biotherm plankton series! Wow your skin looks so good and healthy! !